Skeletons and Pandas and Elsas, Oh MY! It’s all fun and games at the Many Small Friends school Halloween party, until the lights go out! Sophie made these costumes from supplies she found at the dollar store! What?!? 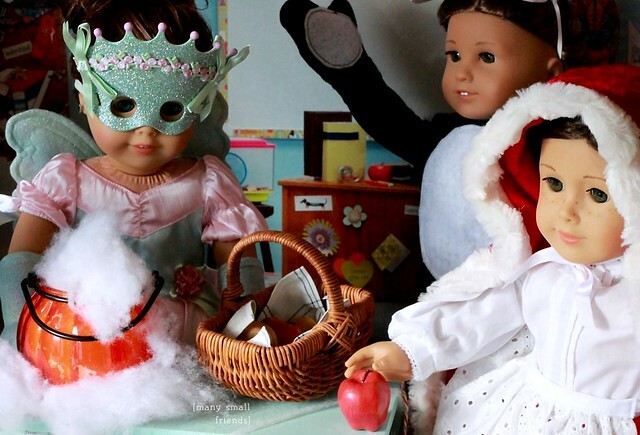 It’s real-life Dolly Project Runway and Sophie totally made it work. 😀 I’m particularly in love with the hats. If you want to see how she cast her magical spell on dollar store supplies, check out her guest post on Karen Mom of Three’s Craft Blog. I’d love to see your costumes and Halloween displays, too! If you’d like to share your work, you can post your pics on our dolly Facebook page or email me to post for you. Be sure to send me a link to your [blog /Instagram /Flickr/etc.] if you’d like your photo linked. This entry was posted in Doll Video, Dolly Holiday and tagged 18" Dolls, American Girl Dolls, Doll Video, Dolly Holiday, Halloween. Stephanie, Love your blog! 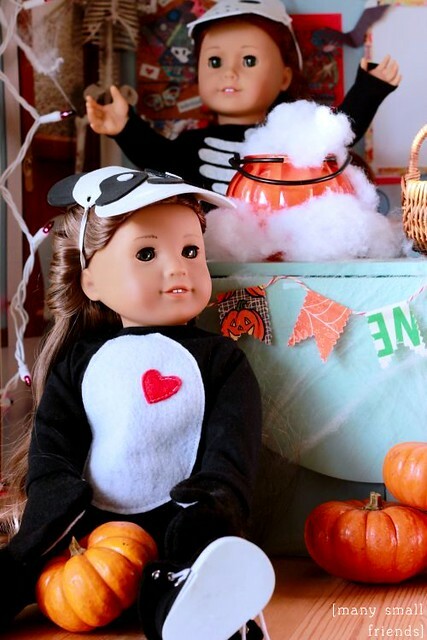 Your doll Halloween party is adorable! Happy Halloween!